In the largest HQ2 offers made public, records show the airport was working with the cities of Irving, Euless, and Grapevine to package massive incentives. DFW International Airport submitted a pair of bids to Amazon for its second headquarters—working in one case with the cities of Irving and Euless and in the other with Grapevine—that would have each topped $20 billion in tax breaks over the next century. At more than double the highest incentive offer revealed since Amazon made its choices last month, the attempts set a new standard for the lengths cities were willing to go in an effort to snag the $5 billion capital investment and 50,000 well-paid employees. The airport provided us its bid documents in response to an open records request. Under the respective deals, airport-controlled land would’ve been leased to Amazon over 99 years, meaning the tax incentive would’ve spanned about two and a half times the longest tax abatement period ever, according to Good Jobs First, which tracks subsidies. A Dell plant in Tennessee, the previous leader, is about halfway through its 40-year abatement. “Offering a 99-year incentive is madness,” says Nate Jensen, a professor of government at the University of Texas in Austin who specializes in the area. 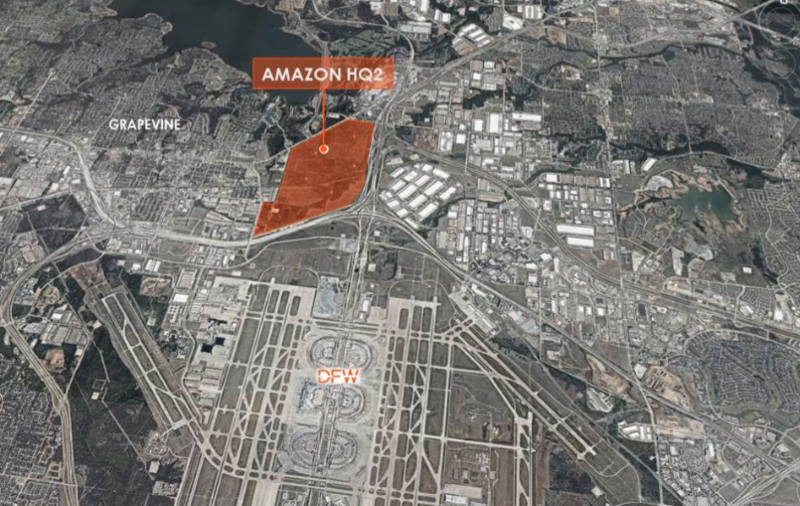 Under one of the plans, officials proposed that Amazon build HQ2 at Passport Park, a new business development on the south side of the airport. The proposal would’ve put the headquarters within the city boundaries of Irving and Euless, on about 250 acres of developable land. Amazon was to benefit from a tax incentive valued at $22.7 billion within Passport Park through “entering into a 99-year ground lease and assigning the improvement’s ownership interest to DFW Airport,” according to a pitch document compiled by the airport. Arlington had additionally agreed to spend $50 million to connect the development to the TRE Centreport Station, bringing the HQ to Dallas and Fort Worth via rail. A package of $22.7 billion would’ve easily marked the priciest incentive deal in U.S. history. The state of Washington put together an $8.7 billion package for Boeing in 2013. 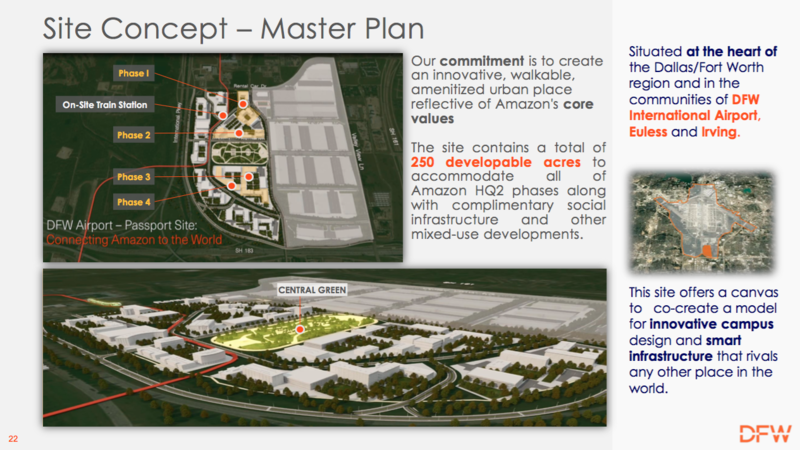 A slide from the airport’s pitch with Irving and Euless. The other plan was a site at the north end of the airport, located within Grapevine on about 700 acres of workable land. Incentives would’ve totaled $20.4 billion over the 99-year lease, according to documents. Neither proposal included a clawback provision, whereby DFW would be able to take back incentives if Amazon didn’t hit certain requirements. DFW Airport has in recent years added industrial parks, car dealerships, and hotels to the property it controls, which sits on a swath of land encompassing pieces of Grapevine, Coppell, Irving, and Euless. Amazon itself has about 2.6 million square feet of e-commerce fulfillment centers at the airport. When the bids were submitted, in October of last year, about 28 Prime Air flights were leaving the airport each week. Developments located on airport grounds enter leases with the airport, which does not have the authority to tax. But the airport has revenue-share agreements with host municipalities, as well as the cities of Dallas and Forth Worth, which own the airport. “This is a variation on that theme, where you’ve got an airport authority (controlling) the land and able to get an extremely low assessment rate on improvements, to effectively, greatly lower the property tax value,” says LeRoy, who reviewed the documents. For the airport, a 99-year lease is not unheard of, according to VP of Commercial Development John Terrell. He says the entity has two active leases of that length, including one with a new American Airlines facility. The city of Irving declined to comment, directing all questions to the airport. The airport’s proposed slot in Grapevine. There’s no indication that this sort of plan would’ve been attractive to Amazon. In seeking proposals, the retailer asked cities to take into account the difference between a dollar today and a future dollar by introducing into their calculations a 6 percent discount rate. This was supposed to help cities determine the present value of future funding. “Amazon would prefer incentives up front that they can spend or invest in a way to make more money, as opposed to money in the future,” says Jensen. At a 6 percent discount rate, $1 billion in 10 years would’ve been worth just $558 million to Amazon now—meaning CEO Jeff Bezos’ team would prefer $559 million today over receiving $1 billion in 10 years. In Amazon’s eyes, and according to Jensen’s calculations, $3.1 million up front would’ve been preferred to a $1 billion incentive that it would have to wait 99 years to receive. The airport’s proposals signified a “present value” of $1.26 billion on the Irving and Euless deal and $1.13 billion on the Grapevine deal. LeRoy figures Amazon’s extensive team of subsidy experts saw right through the lofty figures associated with these long-term plans. But there is one way the retailer might’ve found them helpful—the gaudy numbers could’ve been flashed at officials in Virginia or New York to drive up their price. “I’m curious to know as we see the correspondence from Virginia and New York and maybe Nashville, too, to what extent or not was the size of this Dallas deal used as leverage to cajole them to offer more money?” LeRoy says. Incentive offers have trickled out in the weeks since November 13, when Amazon announced it would split its second mothership in two, with locations in Crystal City, Virginia, and Long Island City, New York, as well as a manufacturing facility in Nashville. Combined, it received incentives valued at about $2.5 billion for those moves. The city of Dallas packaged a deal worth $600 million for Amazon, which would’ve accompanied another $500 million from the state. The area’s largest incentive package prior to the airport’s disclosure was Arlington, which valued its deal at $921 million. Nationally, Montgomery County, Maryland, raised eyebrows when it was announced that the package it put together to lure Amazon was valued at $8.5 billion, including a $6.5 billion bundle approved by the state legislature. We rounded up a handful of suburban deals in a post last week, which also discussed just how shy some municipalities have been in revealing the information. Irving was one of the cities that appealed our request up to the Texas Attorney General, as did the cities of Frisco and Plano. Those requests await a decision from the AG, which has 45 days to respond. When a reporter here asked for Plano’s incentives earlier this year, the city appealed and was told by the AG to give them up. Instead, the city sued to keep the documents under wraps. That court case is ongoing.